Austin KUTX FM: "Western Americana, a cross-pollination of rock, folk, and country with psych and indie pop – influences from Texas and Brooklyn backgrounds. It’s the soundscape that occurs when indie rock and country artfully cross paths." Can’t Stand Still was recorded in Austin at Z Sound Recording and at Jim Eno’s (Spoon) Public Hi-Fi and mastered by Brian Lucey at Magic Garden Mastering (Beck, Black Keys, Arctic Monkeys). The album was named “one of Austin's best discs of 2015” by the Austin Chronicle and was featured on their year-end “Top 10 Locals You Didn’t Hear” list. Their single “Steel” was selected as a Top Tune Download of the Day by KCRW in Los Angeles and received airplay on stations throughout the U.S., Europe and Australia. "There’s a bounty of country-psych awesomeness from this Austin band. 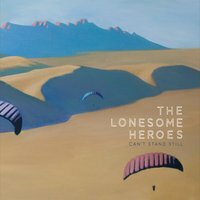 The Lonesome Heroes release Can’t Stand Still revels in that groovy cosmic American indie-pop vibe, speckled with dusky shades of golden FM road trip sounds."